Radio access technologies for mobile broadband have evolved effectively to provide connectivity to billions of subscribers and things. Current Radio Access Network architecture is undergoing a transformation to increase deployment flexibility and network dynamicity, so that networks will be able to meet the performance requirements demanded by applications such as extreme mobile broadband and long-range massive machine type communication. Next generation 5G networks will cater for a wide range of new business opportunities, some of which have yet to be conceptualized. They will provide support for advanced mobile broadband services such as massive media distribution. Applications like remote operation of machinery, tele-surgery, and smart metering all require connectivity, but with vastly different characteristics. The ability to provide customized connectivity will benefit many industries around the world, enabling them to bring new products and services to market rapidly, and adapt to fast changing demands, all while continuing to offer and expand existing services. To prevent total cost of ownership from soaring, the 5G architecture will be software configurable and split between general purpose and specialized hardware, in a way that enables optimal placement of networks functions. 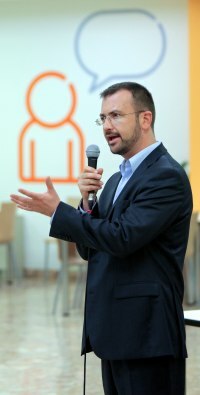 Sinisa Krajnovic is a senior executive in Ericsson with long and varied international management experience. Since 2011 he has been living in Stockholm, Sweden. He works in Ericsson as Vice President and Head of Development Unit (Engineering) for Network Products, leading a global development organization consisting of over 10,000 R&D engineers. He has held various management positions in Croatia, UK, Ireland, Japan, Hungary, and Sweden. Sinisa Krajnovic is also a guest professor at the Zagreb School of Economics and Management (ZSEM), and program director of the ZSEM’s General MBA Program. He is a guest professor at the Luxembourg School of Business (LSB), and member of the LSB Advisory Council. He was a co-founder and the first president of the Croatian branch of the Project Management Institute, the leading global project management organization. Krajnovic earned his PhD degree from the Faculty of Electrical Engineering and Computing at the University of Zagreb, and completed executive business/management education programs at Columbia University (US), Cranfield University (UK), IMD (CH), ISB (IN), and University of Zagreb (HR).